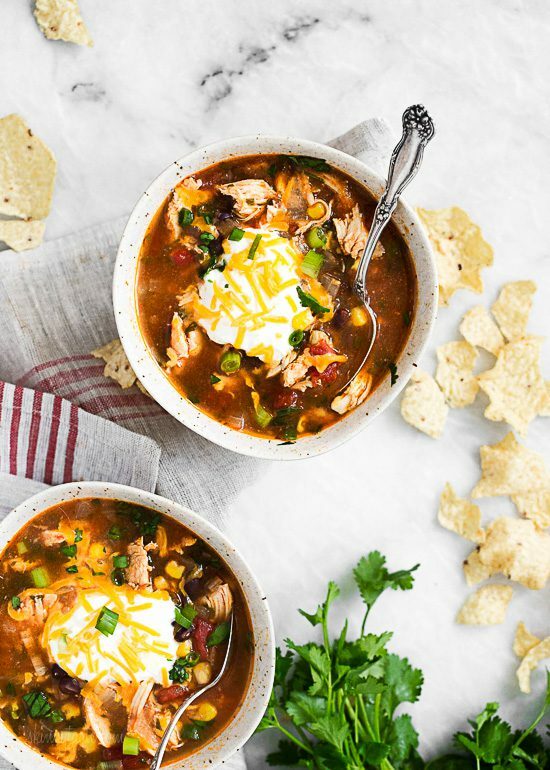 Everything you love about chicken enchiladas… in one big bowl! 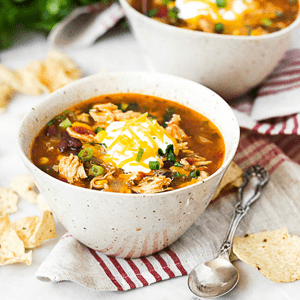 This recipe is a twist on the classic chicken enchilada recipe but is modified by adding some black beans, corn, and chicken broth. After a few hours of letting it slow cook all day, this delicious bowl of soup emerged which I topped with cheese, scallions, cilantro and a dollop of sour cream. Avocado would also be awesome. This was very tasty, filling and had just the right amount of heat. Add more or less chipotle to your taste. 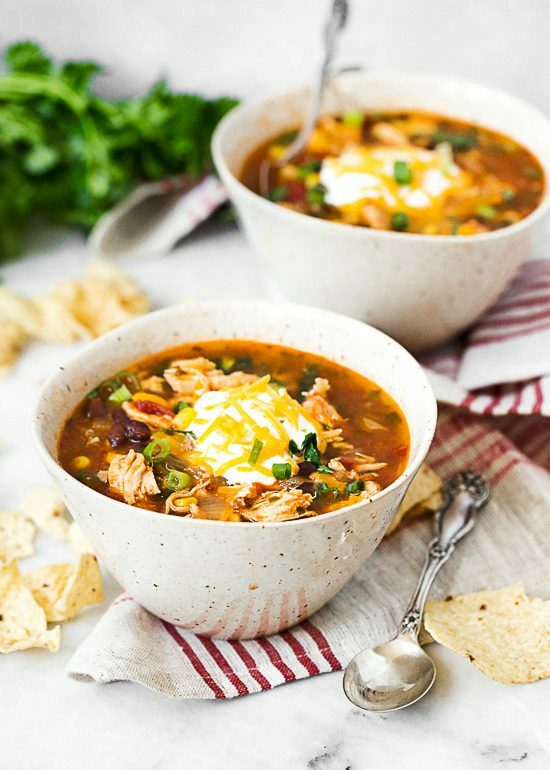 This recipe can also be ecreated in the Instant Pot. It’s also considered freezer friendly, which makes it a great dish if you like to make freezer meals. To reheat you can let it thaw overnight and reheat it on the stove. Add the drained beans, diced tomatoes, corn, cumin, oregano and stir. Add the chicken breasts; cover and cook on low heat for 4-6 hours. Remove chicken and shred with two forks. Add chicken back into the soup, adjust salt and cumin to taste. Serve in bowls and top with cheese, avocado, scallions and cilantro. Also great with sour cream or crushed tortilla chips. Enjoy! Press saute on the Instant Pot. Add onion and garlic and sauté until soft, 3-4 minutes. Slowly add the chicken broth, tomato sauce and chipotle adobo sauce and cilantro. Add the drained beans, diced tomatoes, corn, cumin, oregano and stir. Add the chicken breasts; cover and cook on high pressure for 20 minutes. Quick or natural release.